Okay, so you’re a responsible citizen and you want to be able to to keep yourself in the loop with all of the politically active peeps in your posse. Bravo! Look at you! But wait! The news has become so chaotic that every time you turn on the TV or open your news app you’re so inundated with negativity that your anxiety is creeping into the red while your depression is asking you to crawl back under the covers. An entire generation is learning (some would say the hard way and I’d be one of them) that informed citizenship is crucial. While voting may never have been a top priority for you, chances are you’re feeling the pressure to punch that ballot in November, and, let’s be real, you should! So how can you keep yourself in touch with what’s going on in the world around you without devastating your mental health? It’s not always easy and, if your life experience is anything like mine, you probably get all kinds of bad advice. My favorite you ask? “Just unplug for awhile. If you don’t watch it, it won’t affect you so much!” Ugh! Whenever someone says that to me I want to say “Oh sure, the best way to treat my depression is to completely remove the things I care about. Okay, so you want to keep informed but watching a 24/7 news cycle is pretty much a one way ticket to Breakdown Town. Make like a bad date and turn everyone off! Instead, I try to limit myself to 3 news sources in a given week. In the mornings, I start my day with a short, informative, unbiased podcast that gives me a rundown of the daily deeds I need to know about. Throughout the week I read a news app, check my Twitter feed, and occasionally dabble in in-depth sources like political podcasts and investigative reports to give me a deeper look at more serious issues. The NPR Politics Podcast is an excellent source of political coverage without being ultra inflammatory or uber biased. (Unless you’re hyper partisan in which case you pretty much consider anything outside of your own opinions to be totally biased!) I suggest trying out a few different news sources and evaluating the way you feel after indulging in them. If they leave you feeling hopeless and you find yourself googling “thunder jackets for humans,” you should probably take a pass. There’s nothing like comedy to keep you engaged and informed which is why sources like John Oliver, The Daily Show, and the myriad of hilarious political podcasts have such enormous audiences. When you feed your need for news while tickling your funny bone, you can walk away feeling good about what you learned. Keep in mind, however, that comedic sources, no matter the medium, often have an agenda. Entertainment-based news is just that: entertainment! They rarely cover fringe stories and instead live to make light of the headlines to keep their audiences captivated. 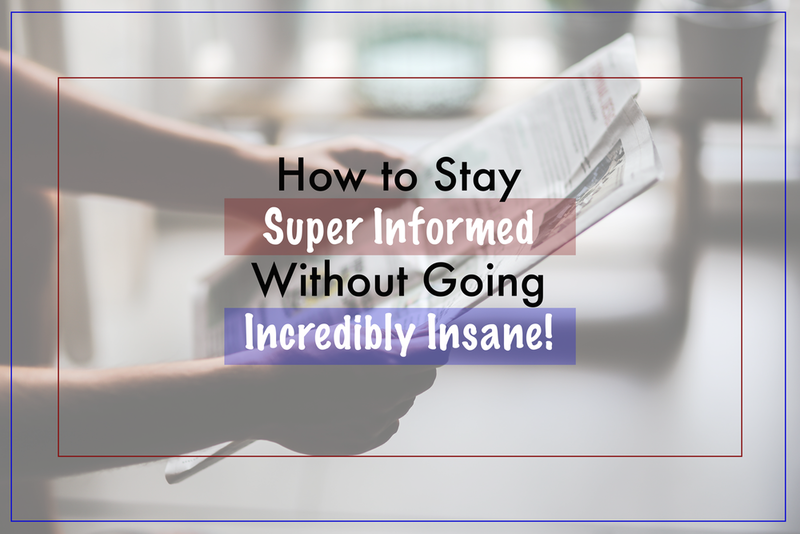 While they’re fun, funny, and usually smart, they’re not meant to give you the in-depth information you need in order to be fully informed. Consider comedy news the chocolate cake of your news diet; instead of eating the whole thing every week, take a slice and then go look for some spinach style news to balance it out! Social media platforms have become a unique and interesting space in the news atmosphere. These non-media media companies (who are they kidding?) have come under enormous scrutiny for so many political kerfuffles that you may be too afraid to engage with them at all. However, since news travels faster on social media than anywhere else, they’re definitely useful tools that can keep you up-to-date on the latest. Whichever platform you’re on, it’s important to remember that they all feature analytics designed to both keep you there and to reinforce the views you already have. It’s difficult to open your mind and expand to new horizons when literally every political ad, news article, and trending topic is centered around your current beliefs. And, you’re probably not going to find too many meaningful discussions with other users that don’t, in one way or another, devolve into tremendous trolling. While social media can be a great way to know in near real time what’s happening in the world, it’s important to limit your intake so you don’t get completely stuck in your own opinions. Personally, I have a 5 time a day limit, at the most. For example, I check my Twitter feed no more than 5 times a day. I scroll through, comment a few times, and spend no more than 5 minutes on the platform. I’m able to keep in touch with my followers, see what’s going on in the world, and roll my eyes at ridiculousness without being dragged down into a death spiral of depressing disfunction. 4. This ain’t no bedtime story! For a long time part of my evening routine was snuggling up in my pjs with my dog and my hubbs and reading or watching nightly news. With the kids in bed and few distractions, it was easy to feel like it was a good way to wind down with information. Boy, was I wrong! I don’t need to tell you about the level of nightmares I’ve had as a result of some horrific news story and I especially don’t need to tell you how my Iraqi War vet husband’s PTSD felt about this practice either. After a few flashbacks and sleepless nights we knew we needed a change! Now, just like with chocolate, I cut myself off well over an hour before I go to bed. By allowing myself to wind down with a good book or a comedy show, I am able to chill out, relax, and, most importantly, get good, solid sleep, the lack of which can feel fatal to anyone who’s ever experienced anxiety. The way you end your day will greatly determine the quality of the start you get for the next one. If you love nightly news, the beauty of technology allows you to record your show or stream it on one platform or another in the morning or afternoon the next day. You don’t have to miss out but you do have to allow yourself a little time and space to re-human before slipping into your subconscious space! 5. End on a high note! Some days the news can feel so overwhelmingly negative that nihilism seems like the only way to go. Don’t fall into that trap! Sure, stuff gets bad, downright disgusting, and you might even find yourself so fully enraged that you want to march your way to Washington to slap the crap out of the first politician you see! (Call me first, I’ll join ya!) But your after news mood depends greatly on the way you choose to leave it and, believe it or not, you have total control over how you feel about what you read. I actively seek out a feel good fluff piece whenever I’m scrolling through my news app or podcasts or throwing something in my streaming list. When I’m finishing up informing myself for the day, I choose to visit that last piece and read, watch, or listen to it from start to finish. Stories where people step up, show out, or achieve the seemingly impossible always make me feel better about the world we’re living in. Hell, even celeb stories help to unravel my tightly wound nerves and I’m not ashamed to say that I’ve kept up with the Kardashians a time or two to keep myself from going entirely over the edge. Bottom line: Yes, we live in a chaotic, over-newsy world where things can feel so dire that not holding a picket sign starts feeling like a crime. But you - beautiful, complicated, you - have total control over how you choose your news. And, when you take that power into your own hands, you’ll start to feel a heck of a lot better about the world we’re in! What To Do When You Can’t Trust Yourself.